I like to ride my bike whenever I get a chance. I ride to the store, to the park, to take my son to preschool, and sometimes just for fun. While I’ve never been in an accident with a moving car, I’ve witnessed several bike vs. car accidents, and its something I want to avoid. 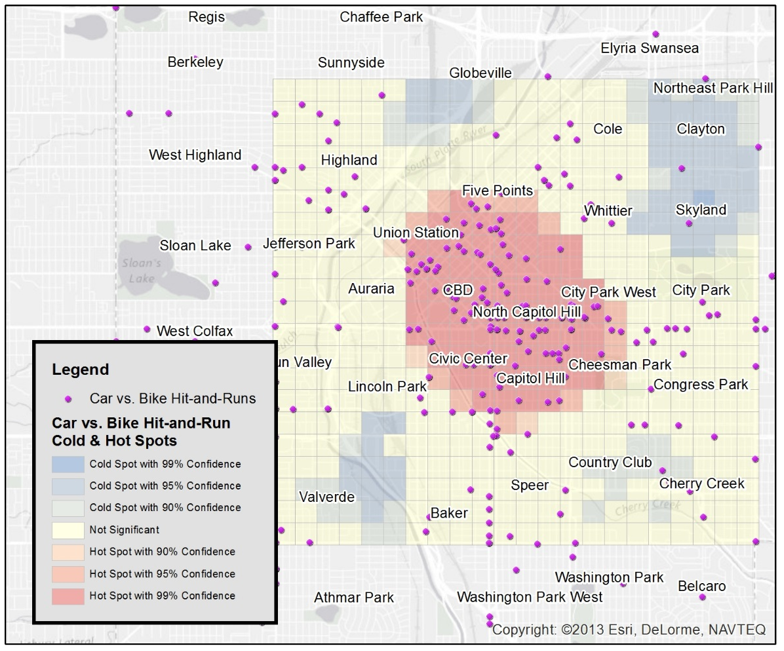 Do you know what Denver neighborhoods have the most bike vs. car accidents? I wanted to find out. Luckily, we can use special mapping software to analyze existing accident data to determine where these types of accidents are statistically more or less likely to happen. Here’s how I did it. I downloaded all traffic accidents in the City and County of Denver from the last five years (accessed here). I filtered to all hit-and-run accidents involving a bike, a total of 345 incidents in their database. I mapped the accident locations using our mapping software. I added the City and County of Denver boundary to the map (I excluded the DIA neighborhood because it is disproportionally large compared to the area of bikeable road). 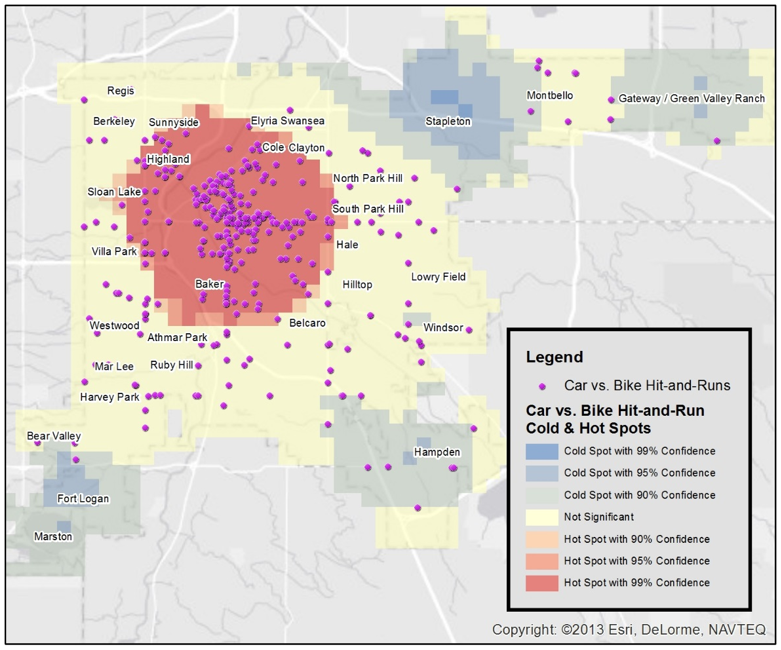 To find locations around Denver with statistically higher or lower clusters of bike vs. car hit-and runs, I ran a hot-spot analysis using location point-counts and a fish-net grid. The result was a large hot spot of accidents in Central Denver, stretching from Baker neighborhood to Sunnyside, and from Sloans Lake to Colorado Blvd. It’s clear that a lot of accidents happen on Broadway/Lincoln Street and a lot are on Colfax Avenue. Many Denver neighborhoods fall into the neutral category (light yellow), meaning accidents happen here, but we cannot find any clusters where accidents are statistically more or less likely. If you look at the edges of the city limits, we find a handful of neighborhoods overlapping cold-spot clusters. 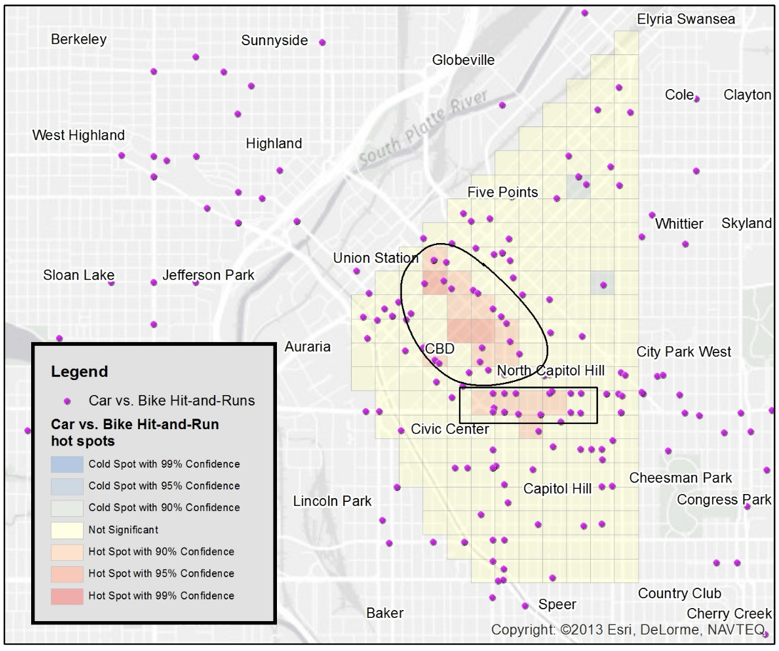 Specifically, Fort Logan (just south of Bear Valley), Hampden, University Hills, North Stapleton, and Gateway/Green Valley Ranch are all neighborhoods where hit-and-run bike vs. car accidents are statistically uncommon, according to this analysis. While its helpful to know that central Denver has a lot more accidents than the surrounding neighborhoods, this isn’t surprising considering a lot more bike and cars are simultaneously navigating around Denver’s core. I wanted to get more specific and useful insights, so I re-ran the hotspot analysis focusing just on the area east of Federal, south of 49th, west of Colorado, and north of Alameda. Downtown Denver still lights up as a hot spot for hit-and-run bike accidents, but again not to the scale that I found useful. So I zoomed in once more, this time exploring the area within Blake, Speer, 6th, and Downing. The result: the greatest concentration of these accidents happen in the Central Business District (especially along 20th Street) and east-west along Colfax Avenue and 16th Street. If I was in charge of reducing the number of car-bike accidents in Denver, I would prioritize these two areas. Of course this analysis can’t suggest what type of actions would reduce accidents (e.g., new rules, more enforcement, better education), but it gives us a place to start. I am interested in biking, so this dataset was of interest to me. What interests you and your organization? Do you want to know if your challenges (e.g., crime, complaints, reduced sales) or opportunities (complements, desired behavior, brand recognition) are really clustered? If so, give us a call and we can discuss how mapping may be a good way to gain a new perspective and help answer your important questions. Previous PostShhhhhhhh!! Did you know there are three secrets to strategic success?Next PostHow representative is that qualitative data anyway?